While we won't be able to travel to the beach this year, we have been cooling off with a fun beach thematic unit. I created my beach book adventure packet for my boys. 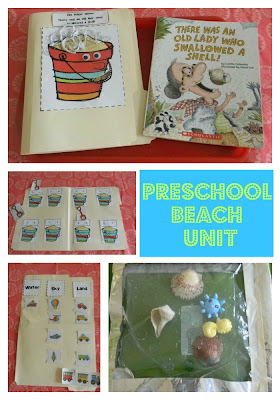 This preschool pack is a thematic unit based on my best books for the beach list. I chose the skills that I wanted to cover in the unit by using my son's pre-kindergarten curriculum. I also designed the packet to be multi-level for families who have learners from toddler to early reader. We've had a lot of fun with this beach themed unit. Create a Water Mat- Try this fun sensory activity to accompany any beach themed book. This is a great vocabulary activity for toddlers and preschoolers. Seashell Letter Sort- Sort uppercase and lowercase letters on seashells in this beach themed game. Water, Land, or Sky Sort- The beach is a wonderful place to observe water, land, and sky transportation. Use this sorting game to sort planes, trucks, trains, boats and more! Seaside Sight Word Stretch- This activity, designed for early readers, helps learners stretch /CVC/ words. Sand Pail Counting Game- Many beach themed picture books incorporate counting. This file folder game focuses on using the skill of counting on to find a missing number. File Folder Game: There was an Old Lady who Swallowed a Shell- This file folder game helps young readers to retell the book, “There was an Old Lady who Swallowed a Shell”. Beach Shape Scavenger Hunt- The beach is a perfect place to find objects of every shape! Take this fun printable to the beach and record the shapes you see on the beach. Early Reader Books- This level 1 early reader book, The Beach, identifies common items found on the beach. There is a reading guide included, as well, that gives parents and teachers tips on introducing the book as well as guiding the reading. Writing Ideas for the Beach- A list of fun ways to practice writing alphabet letters and the letters of a child’s name while visiting the beach. Journal Pages- Differentiated Journal writing pages to accommodate the various levels of early writers. 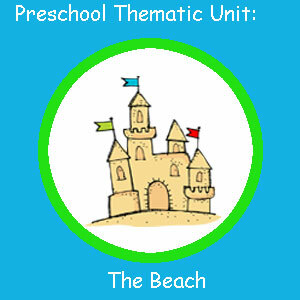 You can purchase the Preschool Beach Thematic Unit at my Teachers Pay Teachers Store. The book list for my unit and book reviews are always available free here at Ready. Set. Read! Check out my book adventures page for other great destinations and great books to take along! Those are some great ideas! When I took care of preschoolers we had a beach day, and another thing we did was have a seashell hunt. I hid the seashells around the house and yard, and the kids hunted for them. Its not as academic, but its kind of a problem solving activity! Great ideas and what a cute unit! That water mat looks really fun - did you just use a baggy? Thanks for sharing at The Sunday Showcase!